Well, summer is over and we are in the middle of harvest season. We hope that you were able to get any seed system maintenance you needed taken care of and it’s all smooth sailing from here on out. However, we know that, despite all the best efforts and intentions, sometimes things just go wrong. 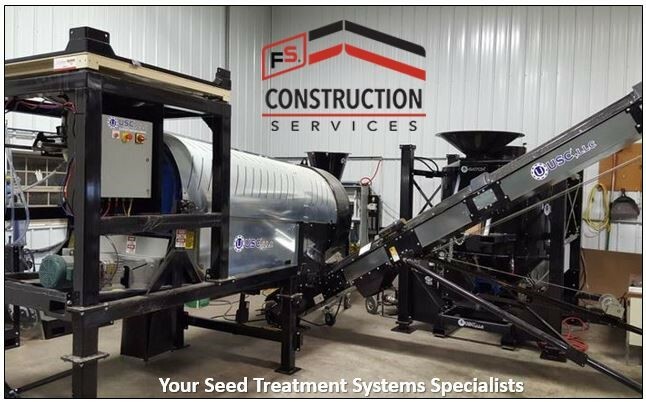 To help out, here is our third and final round of FS Construction Service’s preventative maintenance articles for your seed treatment system. While technology is amazing, and seed treatment has become an art of repeatable, computational precision, there are always going to be things that are simply out of our hands. We’ve been in the game long enough to know we have to respect, and be prepared for, the unpredictable. So we’ve come up with a few ways that we can be as ready as possible should a problem with your seed treater arise. We keep ourselves well stocked with a vast number of different parts. Sometimes the smallest thing can cause the biggest problems, so we keep a lot of seed system replacement parts on hand in case of an emergency. We have a dedicated USC technician on staff. He knows this equipment inside and out and is quick to not only diagnose a problem but pinpoint its solution as well. We focus on service. We make it a point to get to our customers as quickly as possible, so they can be up and running as soon as possible. All of these things came into play recently when a pump board when out on a seed treater in Kentucky. The cause: not a faulty part or bad operation, but a power surge thanks to a lightning strike. To ensure our client could get back to work quickly, our service technician met him halfway with the needed replacement, so he could get his system running again within the day. We’ve been doing this long enough to know that it always pays to be prepared. Whether you’re getting your system checked and cleaned before harvest, or you find yourself in a sudden bind, we are there for you. We hope this series on preventative maintenance has been helpful, and as always, if you have any questions about our seed system services, please feel free to reach out to Gateway FS Construction Services. You can give us a call at 866-551-3454, and let our specialists help you find exactly what you are looking for. We look forward to providing you the best customer service experience. 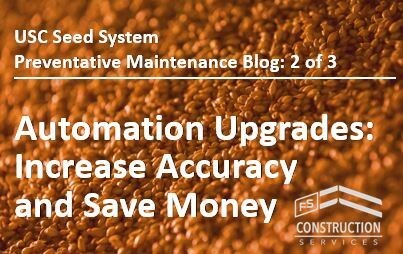 Welcome to the second round of FS Construction Service’s seed system preventative maintenance articles. Like we said before, a little maintenance can go a long way when it comes to keeping your seed treatment systems effective and operational, and our goal is to give you the information you need to keep your equipment in the best shape. 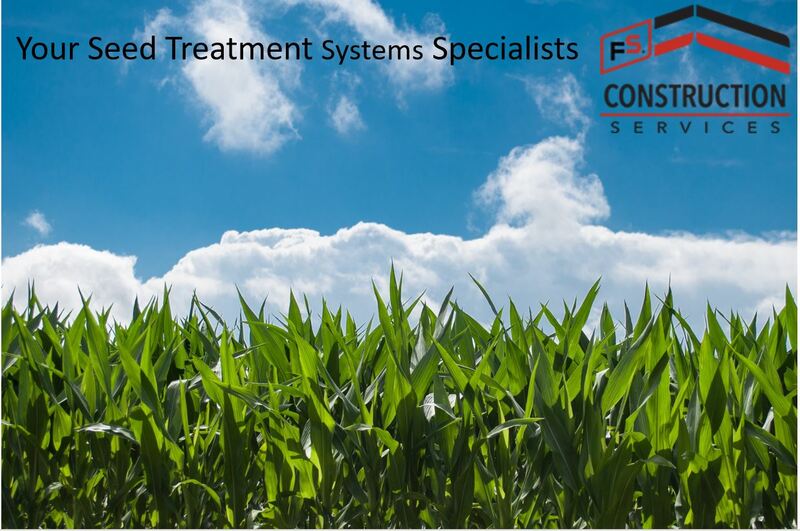 What follows is a description of the service you receive when an FS service professional comes out to take your seed system through the preventative maintenance process. One of the wonderful things about seed treatment systems is their precision. Knowing that you can program and produce an identical dressing for seed year after year that can be applied consistently and evenly each time brings with it some serious peace of mind. However, none of that happens by accident. Thanks to the advancement in seed system technology and automation, the margin for error has decreased significantly. Obviously, automatic systems sound wonderful, but it’s also no surprise that we have found there are a number of manual seed systems still out there. Brand-new equipment is expensive, we get that. That’s why our Seed Treating Solutions experts retrofit older treaters with automation upgrades. Our team can perform recommended maintenance and upgrades on any USC treater to turn previously manual processes to automatic processes. Most commonly what this means is that we will add a seed wheel system to keep you at your desired rate of flow and level of seed treatment. However, there are other simple ways to upgrade additional processes that are not only low cost, but can increase the accuracy of your system’s chemical delivery by 99.95%. So, if you’re still using a manual seed system and aren’t yet ready for a whole system upgrade, let FS Construction Services know. We can inspect your equipment and determine ways we can make your job easier and your product more consistent. To schedule maintenance, or get answers about maintaining or upgrading your seed system, reach out to Gateway FS Construction Services. You can give us a call at 866-551-3454, and let our specialists help you find exactly what you are looking for. We look forward to providing you the best customer service experience. Seed systems and treaters are amazing pieces of machinery. Modern technology has allowed for more precision and consistency in seed treatment, assuring not just an even application, but the ability to treat seeds exactly the same way year after year. This kind of reliability brings considerable peace of mind, but it doesn’t happen accidentally. Some of the most important work you can put in on your seed treatment system happens before you ever need to turn it on. 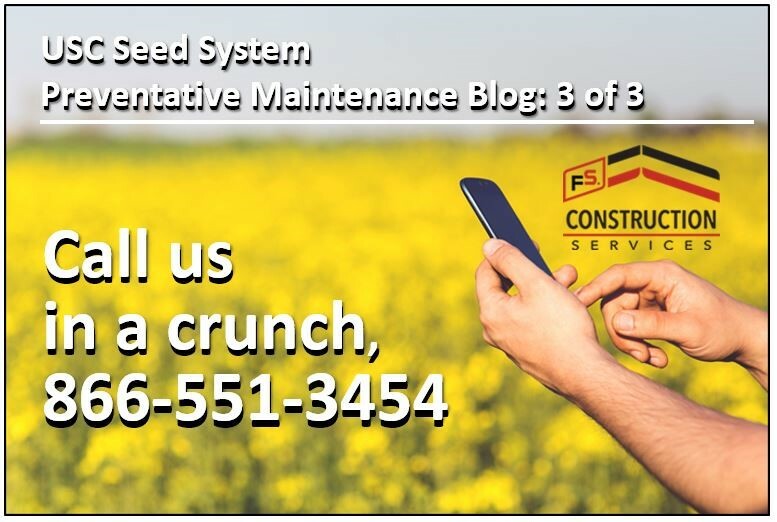 Tapping the knowledge of our agricultural equipment experts, FS Construction Services is going to release a series of preventative maintenance articles covering both seed and grain systems. Says Justen Kempfer, our Seed Treating Systems expert, “A little maintenance can go a long way when it comes to keeping your systems effective and operational, and our goal is to give you the information you need to keep your equipment in the best shape.” What follows is a description of the service you receive when an FS professional comes out to take your system through the preventative maintenance process whether you use USC, Meridan or any other of our partner manufacturers. When it comes to seed systems, there are two types of preventative maintenance: standard and bin site. When we come out to perform our standard maintenance service, we will check your system’s inlet, outlet, treater, belts, bearings, and inspect the equipment for any other possible issues. Standard maintenance covers things like: tightening the motor coupler, cleaning the atomizer chamber, checking the ball valves on the mix tank, inspecting the pump motor, and checking timers and relays. A bin site inspection is a full-systems check from top to bottom and takes about six hours to perform. For either of these types of maintenance, we recommend you schedule between late fall to late winter. If you are interested in having an FS professional come out to your site to perform a maintenance check, please allow a four-week lead time. Scheduling as far in advance as possible will give us the best chance to find the time that fits most conveniently into your schedule. If you would like to schedule maintenance, or have any questions about our seed system services, please feel free to reach out to Gateway FS Construction Services. You can give us a call at 866-551-3454, and let our specialists help you find exactly what you are looking for. We look forward to providing you the best customer service experience. Take Advantage of USC’s Wave of Summer Savings! Relying on old equipment can be a major cause of on and off-the-job stress. 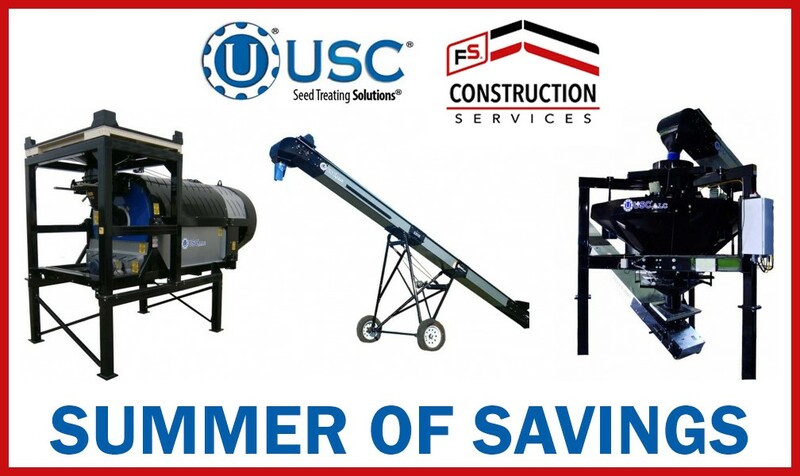 Thankfully, our partners at USC Seed Treating Solutions have started their Summer of Savings event, meaning you can upgrade or add a new seed treater, conveyor, hopper, or more at significantly less cost to you, and you can say goodbye to worrying over old or malfunctioning equipment. Wave 1: Order between May 1 and June 30. Wave 2: Order between July 1 and August 31. Wave 3: Order after September 1. Ordering after September 1 will give you the option of deferred billing. Deferred billing is payable through November 30. A down payment is required and other financing options are available. All orders are subject to credit approval. 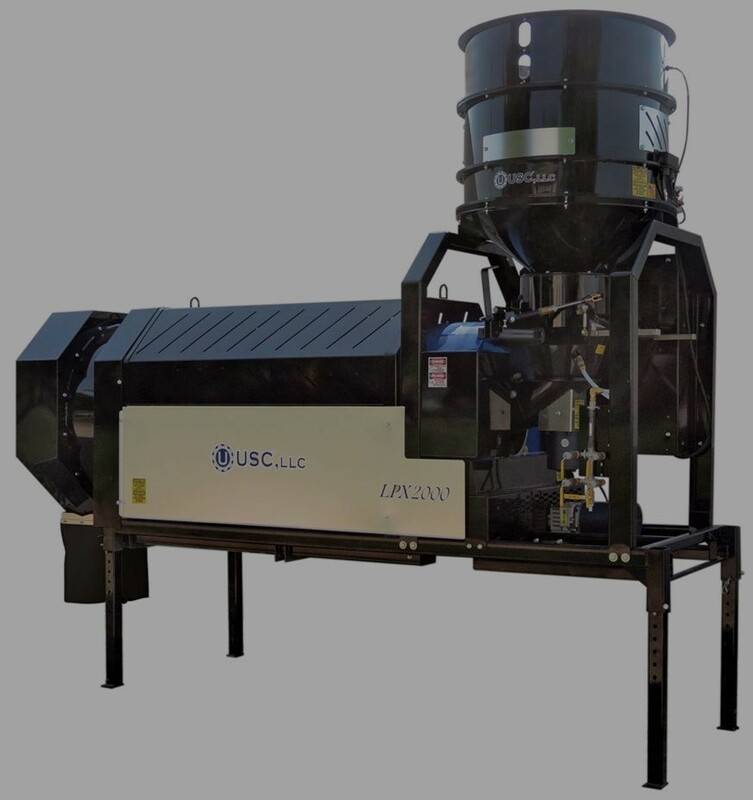 If you have any questions about USC’s Summer of Savings or about seed treating equipment, you can let Gateway FS Construction Services know. You can give us a call at 866-551-3454, and let our specialists help you find exactly what you are looking for. We look forward to providing you the best customer service experience. With the holidays in the rearview mirror and 2018 officially started, it’s time to start looking forward to what the new year will bring. 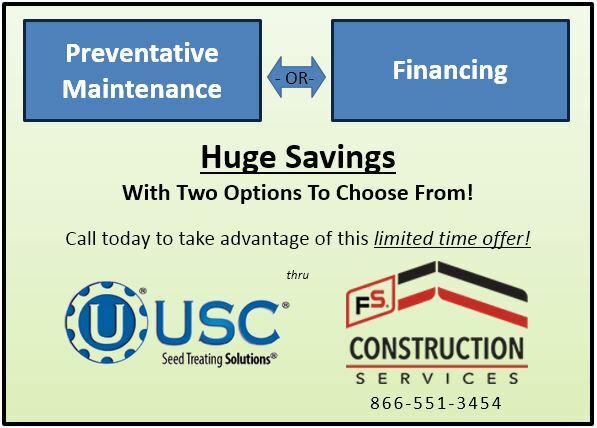 In the interest of getting the year started off on the right foot, FS Construction Services wants to highlight a new promotion from our partners at USC Seed Treating Solutions, which will be great for anyone in need of new seed treating equipment. For a limited time, USC is offering two different promotional options for purchases of $40,000 or more. This will allow you to choose between a couple of financing options for your new equipment or, a couple of preventative maintenance options to keep your new equipment in top shape throughout the year. The first available financing option is a 3-year, 1.9% APR with zero down. This plan will have three annual payments and the first payment is three months from delivery. The second financing choice is a 12-month same as cash option. This plan also features zero down and requires 20% to be paid three months from delivery, and the remainder to be paid 12 months from delivery. 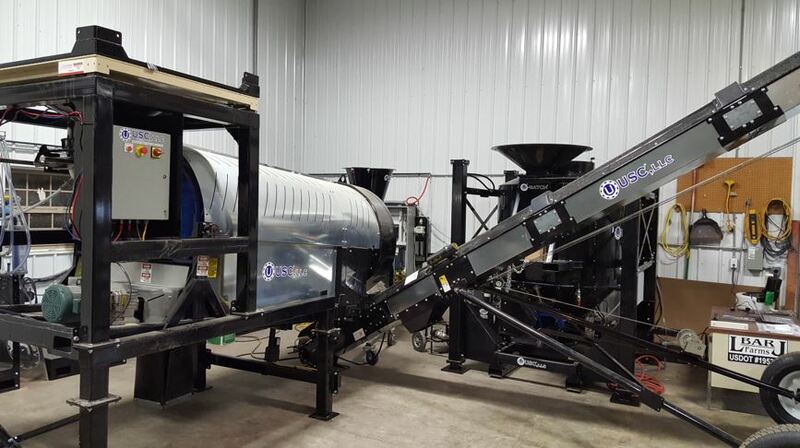 The first option is a box to box setup which includes maintenance* on the seed treater and two conveyors. If you choose this first one, the dealer will perform a complete preventative maintenance on your equipment after each of the first two seasons. The maintenance will be completed between July and February. The second option is for a bulk site, and includes maintenance* on the seed treater and all other bulk site equipment. This choice also includes the dealer performing a complete preventative maintenance on your equipment after each of the first two seasons. The maintenance will be completed between July and February. 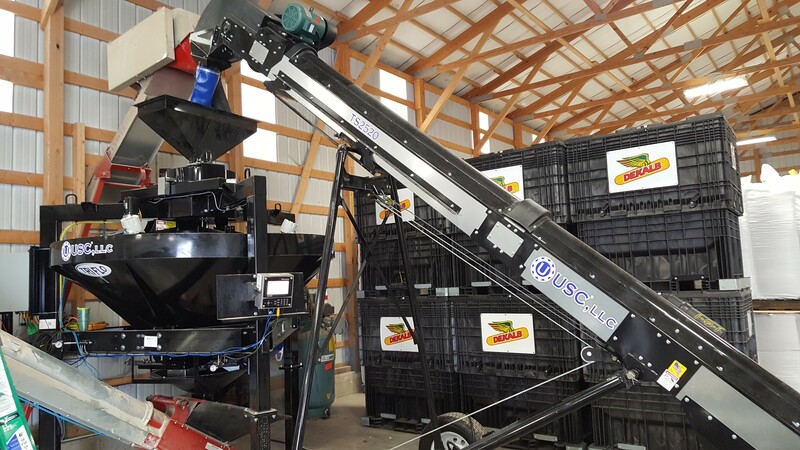 *Preventative Maintenance includes adjusting conveyor tracking to avoid a shortened belt life and an atomizer chamber cleaning to ensure an accurate seed coverage. If you have any questions about financing or any of the promotional options, please contact our Seed Treatment Solutions Product Representative, Justen Kempfer. Or, if you have any other seed treating questions, let Gateway FS Construction Services know, you can give us a call at 866-551-3454, and let our specialists help you find exactly what you are looking for. We look forward to providing you the best customer service experience.